Thank God for revealing what has been hidden. Thank God for giving Prime Minister Netanyahu boldness and wisdom. Pray that the U.S. and our allies would work together in unity to deal with Iran. 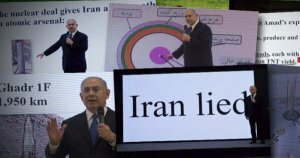 Watch Benjamin Netanyahu’s presentation of the Israeli discovery of Iran’s nuclear weapon program here: https://www.youtube.com/watch?time_continue=1&v=_qBt4tSCALA. Father forgive us for providing money to Iran & selling nuclear weapons to them, knowing of their intent to be a nuclear super power. We know that Iran will take from us & Russia both. Spare us from making further mistakes regarding this country. Protect us from their evil intent. Give the our leaders wisdom, discernment & integrity to not abuse our power& protect us & Israel; give peace to Israel. Forgive us & them & heal us from our sins I Jesus’s name. Amen. Thy will be done, thy kingdom come, Father in our hearts and in our lands, in the Mighty Name of Jesus, amen. Father, we thank you for all the men and women of faith in our government, may their light shine brightly and may all that is hidden in the dark be exposed to this light. Send the Angels to protect our president and his family and all the families that are in harms way. Father God, in the matchless name of Jesus, I thank you that everything that man hides in secret becomes exposed by Your light. Thank You for exposing the plans of the enemy to protect Your people, Israel. Thank You for using Presidents Trump and Netanyahu to thrawt the enemy’s plans. We thank You for giving them wisdom and discernment necessary to ensure salvation and deliverance for Your people at such a time as this . May You be glorified in heaven and on earth for Your love and faithfulness to Israel and the United States. Amen.